Rory McIlroy did not win the 2018 Masters. That much you already knew. Paired with eventual winner Patrick Reed on the final day, McIlroy shot a 2-over 74 and finished six back of Reed's winning score of 273. He said on Wednesday that he wound himself down from the Masters hoopla by drinking some wine, watching some shows ("Billions") and reading some books (Essentialism). He was also asked about whether his pursuit of a green jacket would be as big of a deal if it wasn't also for the grand slam. "The Masters has now become the biggest golf tournament in the world, and I'm comfortable saying that," McIlroy said. "I don't care about the U.S. Open or the Open Championship. It is the biggest tournament in the world, the most amount of eyeballs, the most amount of hype. The most amount of everything is at Augusta." The four-time major champion has now finished in the top 10 five years in a row at Augusta National, but he still lacks what Reed now has: a green jacket. Winning one would make him just the sixth golfer ever to win the grand slam, but McIlroy said he's less concerned about that and more concerned about just winning a singular Masters. "For me, it's the most special tournament that we play and it's the one that everyone desperately wants to win," he said. "Even if I was going for my first major, it's tough, it's tough to win. I thought Patrick did a fantastic job on Sunday holding it together because he didn't have his best stuff, but he made a couple key putts coming in which helped him. "So no, I don't think the grand slam, that's not really what I think about. 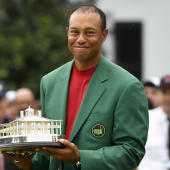 I just think about trying to win the Masters and what that means and being able to go and use the champions locker room, just all the cool stuff that comes along with it." Most think McIlroy will eventually get his. He'll only turn 29 this week, and he has plenty of terrific golf out in front of him. But you do only get so many great chances at this thing, and he's used up one in 2011 and one in 2018. There aren't unlimited swings left. Still, it's fascinating to note how purposeful and unique this pursuit has become for McIlroy. It is the subtext in all other tournaments. It's no longer "Can Phil Mickelson win the U.S. Open?" and it won't be "Can Jordan Spieth win the PGA Championship?" Rather, "Can Rory McIlroy win the Masters?" will prevail for years and years ... until he does. Or unless he doesn't.